When her little sister Nika was born, Darya Ivanova's mother took to bed and stopped taking care of her family. In the absence of a mother figure and while still only a child herself, Darya had to take care of her younger sister, brothers and father. Now she's 18 and with seven-year-old Nika starting school soon, Darya is looking forward to finally having some time to herself again. She dreams of the books she'll read and thinking about her own future. It's not that she doesn't love Nika, but she spent all of her teen years taking care of others and it's time for Darya to take care of herself. But on Nika's Day of Knowledge, the day which should've been the first carefree one for Darya in many years, a group of terrorists take siege of Nika's school. Darya manages to escape but in the heat of the moment she loses sight of Nika. The following days, weeks and months are unbearable for Darya and her family, as they don't know whether Nika survived the massacre and if she did where she is now. I knew woefully little of the terrifying events that happened in the city of Beslan in Russia only so very recently, which made reading it within such close proximity, through the eyes of someone personally affected by the siege (even though those eyes were fictional), even more impactful. Hostage situations are always terrifying but when it involves children it makes it even more horrific and unfair. Mother Tongue opens with the attack and the aftermath lingers for all of its nearly 300 pages, and far beyond. While I felt that we didn't stand still by Beslan enough within this book, I do understand why Darya wanted to leave the place so desperately. Her recent memories of her hometown were unbearable and a new city, one she'd always wanted to go to, could be her escape from the depressing surroundings. And yet, as a reader I wanted to know more about Darya's neighbours we only saw fleetingly and even her parents, even though their seeming lack of interest in Darya's well-being was infuriating. Author Julie Mayhew's rich descriptions of Beslan, and later on Moscow, paint a vivid imagery of Darya's Russia, one in which as a reader I felt I could smell and taste the food (of which there was plenty in the novel) that appeared within the pages. This brought a culture so foreign to my own much closer and created a very relateable story despite so many of the customs and names within being unfamiliar to me. Mother Tongue depicts a horrifying and heartbreaking moment in history with immense care and sensitivity. And while it kicks off her novel, Julie Mayhew does not only linger on the terrifying Beslan school siege. She also deftly transports the reader to the sounds, smells and tastes of Russia with her detailed descriptions, creating a richly layered eye-opener exploring a country and culture not often central within young adult fiction – though if Mother Tongue is anything to go by, it really should be. 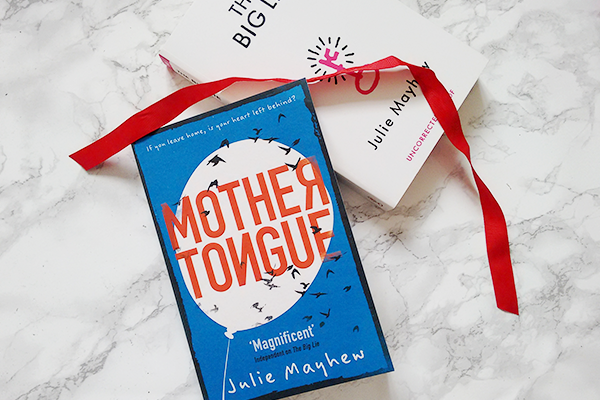 Mother Tongue is published by Hot Key Books and you can buy your copy from Foyles or your own preferred retailer.